The Barber Surf Rake features a new Sanitizing Conveyor "S-Belt." This new belt design maximizes sand penetration and removal of extremely fine debris. Belt perforations, mounting tines underneath the conveyor and eliminating retaining bars now reduces the risk of residual sand removal. Barber beach cleaners work to clean, level and grade any beach they are set to work on. Have you heard about Plugr turf aerators? "My crews have 11 SourceOne Plugrs in the field. We use them all, from the 400 (22-inch PL400) to the self-propelled (30-inch PL855H). These machines are less strenuous to use and maneuver and a whole lot better than drum type aerators. There's just nothing else that works this well." That's from Ken Heltemes of Weed Man in Raleigh, N.C. What more needs to be said? 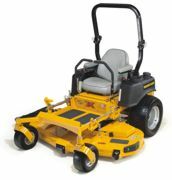 The X-ONETM is a commercial mower at an attractive price without compromising quality and features. The X-ONE updates the popular Hustler Z with proven components and Hustler's new deck with VX4 technology. Production started recently on the X-ONE and is beginning to arrive in the Hustler dealer network. The Field Commander Chameleon utilizes a "one machine, one operator" concept to maintain both natural and synthetic turf fields. This machine can groom, condition, level, paint, stripe lines, apply logos and zone markings, yard markers and coaching boxes. It also sprays water, chemicals and disinfectants for both indoor and outdoor applications. 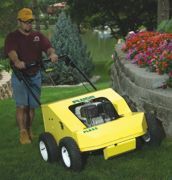 It can even cut a line, and remove painted lines and logos in just minutes. The Field Commander is customizable to meet your needs and budget. 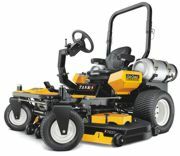 Dixie Chopper builds productive mid-mount, zero0turn mowers, ranging from a 27-hp model with a 34-inch cut to a 40-hp version with a 74-inch deck. 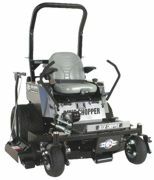 In all, Dixie Chopper offers more than 20 models in five distinct series of mowers. Besides traditional gasoline-powered mowers, Dixie offers a diesel with a Caterpillar engine, a Generac propane unit and the industry's only compressed natural gas-powered mower, the Eco-Eagle. Cub Cadet Commercial is expanding its TANK S series to provide more options for fuel efficiency with the TANK S D and TANK S LP. Like all TANK S units, these boast patented Synchro SteerTM technology for intuitive zero-turn control with a steering wheel and dual foot pedal controls instead of lap bars while giving users the choice of diesel or liquid propane. Both options offer increased fuel economy, extended engine life and are built to handle even the toughest terrain. The PTO-driven AERA-vatorTM aerates and loosens compacted soil in a quarter of the time using a quarter of the labor of walk-behind units, eliminating unsightly cores and increasing water filtration in the root zone by up to four times. Vibrating tines deep-fracture hard, dry soil combinations to create a more resilient surface on playing fields and other high-traffic areas by improving permeability and drainage. Compatible with Grasshopper Model 620T and all 700 and 900 Series FrontMountTM power units. The all-new Toro® Groundmaster® 360 maximizes productivity by combining the agility of a zero-turn riding mower with the flexibility of an out-front rotary mower. Using Quad SteerTM all wheel steering, with the added control of a steering wheel, the Groundmaster 360 has the improved hillside traction and stability to go places inaccessible to most other large-area riding mowers. The machine's Quad-SteerTM technology minimizes turf damage due to the unique steering geometry.